Probably an easy question, does Cumulus VX support MLAG? 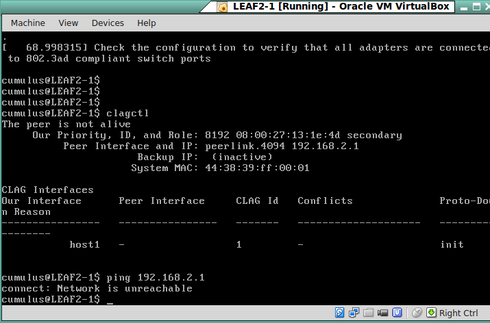 I've followed numerous articles on how to set up a MLAG with Cumulus, however I am reciving the same bonding error. Just remember to keep the clagd-args --vm with the config I linked to ! Am I missing something else? Thank you both for your help. I always have a loopback (or rather, leave the existing one alone) but don't always include it in the configs for brevity. 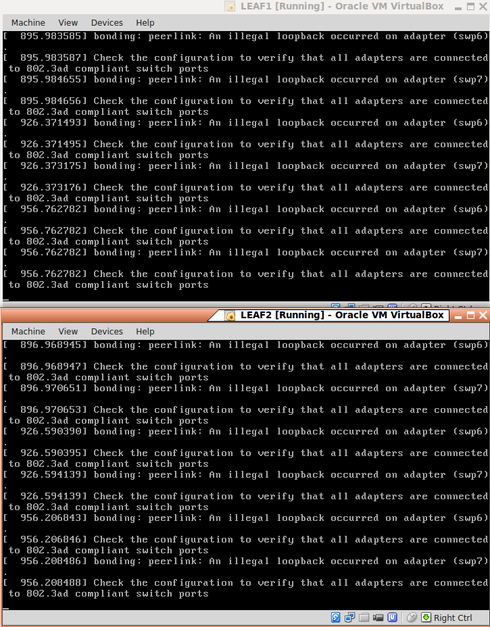 Linux in general really likes having a loopback, I can't think of a single distribution that ships without one. I'm not aware of any specific dependencies of CLAG on a loopback though. Please post the error you're seeing if you get a moment. # The contents below are automatically generated by Vagrant. Where you able to get it working? Can you zip and tar.gz your gns3 topology files? I really don't know why this isn't working. I think I know what the issue might be... try using the first few ports. In other words, use ports swp1, swp2, swp3 with no gaps in between. So I would use swp1, swp2, swp3 etc instead of swp5,6,7. There is a brief note on this in our GNS3 guide ( "e1 in GNS3 corresponds to swp1 in Cumulus VX, e2 to swp2, and so forth" https://docs.cumulusnetworks.com/display/VX/Using+GNS3+with+VirtualBox+VMs ) but it is not explained as to why this is needed. Here is the explanation (which I will seek to add to the Documentation): Essentially when an interface is added in GNS3 it is then created in the VM and in VX vms (today in VX version 2.5.4 and VX version 2.5.3), they are created in order Eth1, Eth2, Eth3 etc. So E1 in GNS3 would map to Eth1 in Vx by default and then when VX boots up, it sees an eth1 interface exists in the VM and renames that interface to SWP1, Eth2 is renamed to SWP2 and so forth. The chance to use SWP5,6,7 would arise only after already creating 7 interfaces Eth1-7 or in GNS3 terms E1-7 Once you straighten out the wiring as described above, you can double-check your port wirings with LLDP which is installed by default. Use "sudo lldpctl" on any of the VX nodes to make sure links are wired together as you are prescribing in the GNS3 topology. You had asked what I am using to get this to work. I am personally using Vagrant with the Virtualbox provider in my setup which wires the ports together using a vagrantfile instead of GNS3. I am also using some additional scripting to re-map interface names out of order. I see from your configuration that GNS3 is using the UDP tunnels as well which is really cool. I have not had a chance to play with the UDP tunnels in Virtualbox to connect VMs. It is possible you may not need all of the adjustments mentioned above for the hidden L2 switch since I believe you are bypassing that by using the UDP tunnels. Hope this helps! Please check this post thoroughly(most importantly all the comments) for MLAG/CLAG support in Cumulus VX. 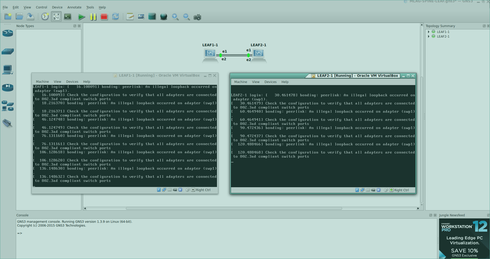 I had also posted on getting started with Cumulus VX in gns3 community. Hi, I just wanted to say Cumulus VX DOES support MLAG. Indeed it is a mystery that how it got working, I do a couple of reboots and now it works most of the times, after 3-4 tries. Thank you for taking the time to set it up. 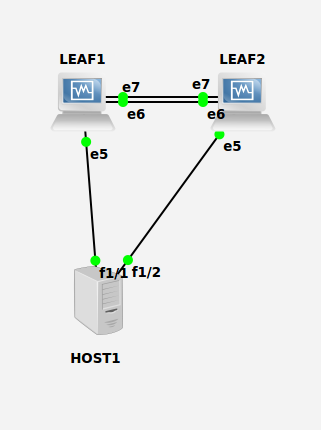 So I’ve destroyed and recreated the VXs and the GNS3 topology to closely match yours. See screen-shot below. I am still receiving the illegal loop-back message The error messages are occurring more frequently now. That is very weird. I even added the secondary peerlink to the bond (as you have pictured in your topology but not configured) and I have not seen this error even once at any point in time. I'm starting to wonder about your version of Virtualbox. 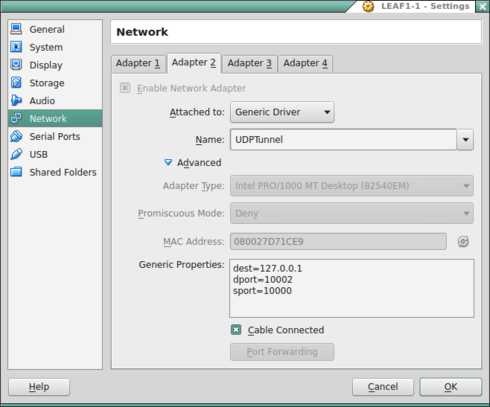 These UDP tunnels that are serving as the interconnects/links between the VMs are handled by Virtualbox. GNS3 simply passes the tunnel endpoint port-numbers to Virtualbox which builds the tunnels and passes the traffic; if traffic is not being passed correctly that would seem to be a Virtualbox issue. 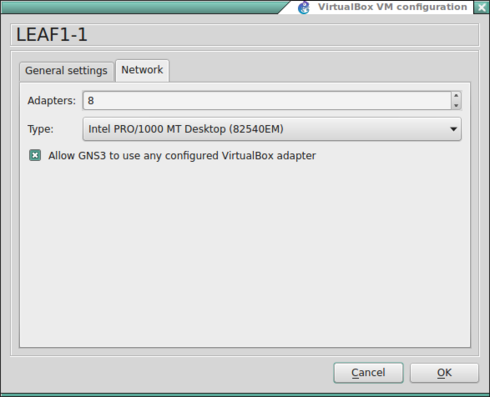 FYI: My versions are: Virtualbox : v5.0.10 r104061 Cumulus VX: Version 2.5.4 GNS3: v1.3.11. Of course if you're a Windows person there's the age-old "when in doubt, reboot" moniker but if it were me I would probably uninstall and re-install Virtualbox with a fresh download of whatever is current on their website.